Open-necked or semi-enclosed vases exude elegance, and are not as difficult to make as you might think, even though they do look somewhat imposing. 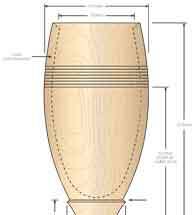 If you are familiar with turning, then it is good to think about this project as an elongated variant of an eggcup. 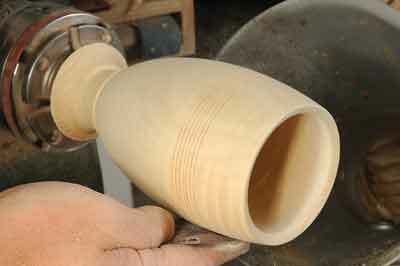 The hollowing of the top opening of the eggcup is the same technique, you just need to go deeper. 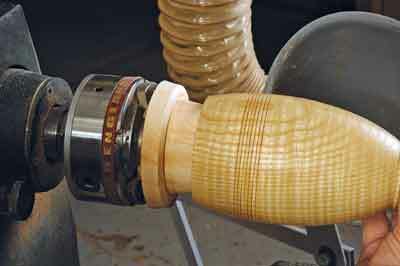 If you are new to turning, then don't let this put you off. I'll try and explain things as simply as possible. I've chosen a piece of ash (Fraxinus excelsior) that has a wonderful grain pattern and this piece has the added bonus of having a ripple pattern in it. This piece is not from a branch as the pith could cause problems for this project. Aside from that consideration, all manner of woods can be used; the wood does not have to be figured or a burr, just choose something that catches your eye and is not too tricky to work with. 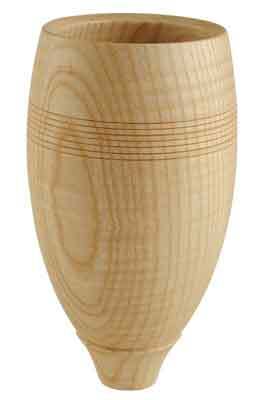 Mount the wood between centres. 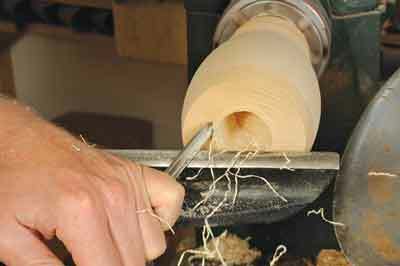 With the lathe speed set at about 650rpm, use a spindle roughing gouge to create a cylinder and to rough shape the vase. The base section will be near the headstock end, but do not make it too thin just yet. Multiple light cuts are needed. 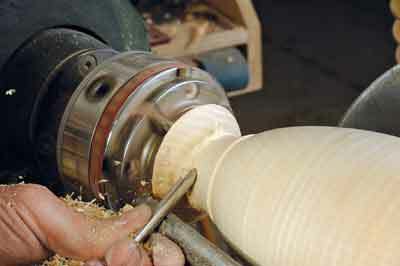 Use a beading/parting tool to clean up what will be the open end of the vase near the tailstock. The photo in the gallery - image 2 - gives you a better view of where I got to. 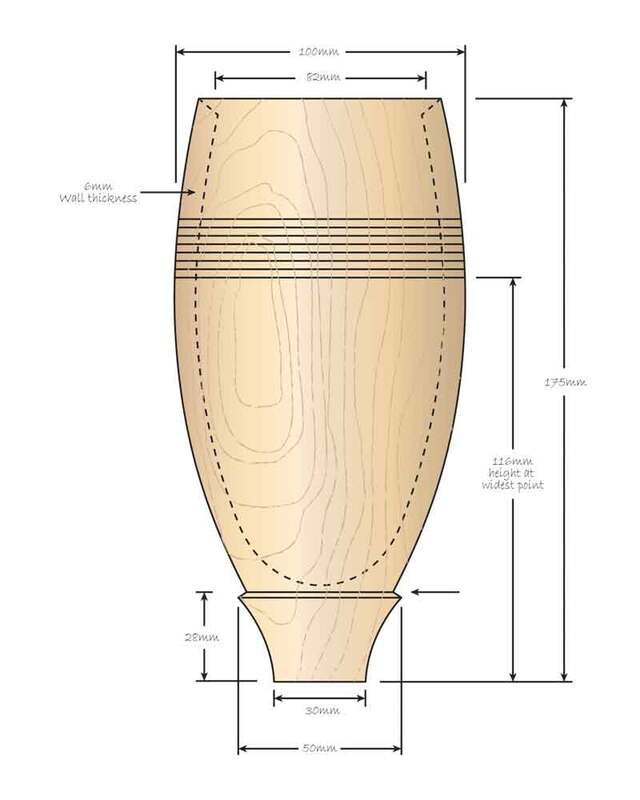 The widest part of the vase is about one-third to two-fifths of the way down from the top edge, so I chose to refine the shape a bit more to give myself an idea of where to hollow to later. Achieving the required final external shape, or something very close to it, will help you gauge wall thickness more easily. The shape is developing nicely. Again, don't make the base section thin yet as you need to have enough strength to resist the forces of hollowing out the inside. 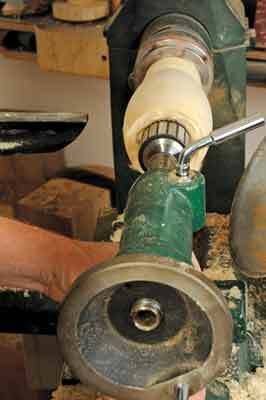 A spindle roughing gouge is an ideal tool to do the shaping. 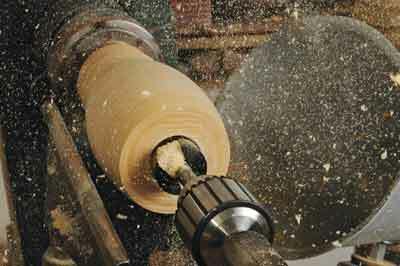 Cut downwards and use gentle cuts to minimise any grain chipping out. 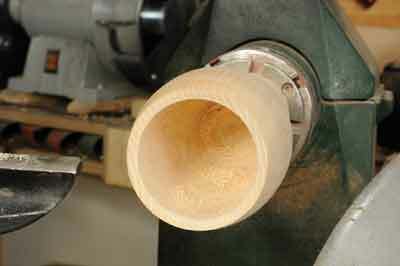 After this, use the beading/parting tool to cut a spigot for your chuck at the headstock end. 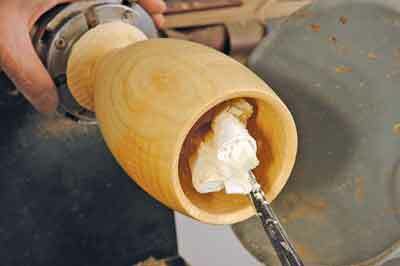 Mount the wood in the chuck on the spigot just cut, and now start to hollow out the middle. I chose to use a drill chuck with a large cutter to cut down to the widest part; I will use a smaller drill later on to go deeper. 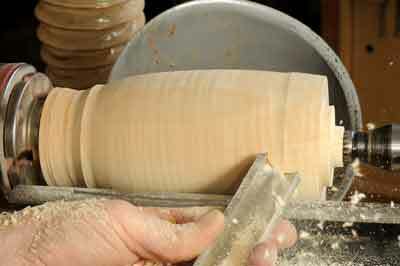 You can, if you choose, use a suitable hollowing technique, which can be carried out with a gouge. 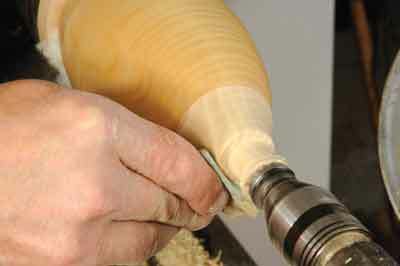 To do this, the spindle gouge is horizontal to the work and the flute is pointed at the 10 o'clock position and then arced out to create a cut. The choice is yours, but if you decide to drill, remember to retract the cutter regularly to remove the swarf to prevent jamming up. 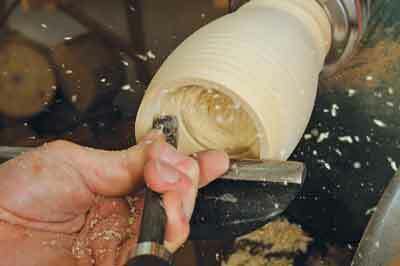 Once you've drilled to the required depth, you can use a gouge to hollow out and refine the opening. It's worth pointing out here that you should always remove the tailstock revolving centre, or in this case the drill bit, to prevent extracting the blade and catching your arm or elbow on them. 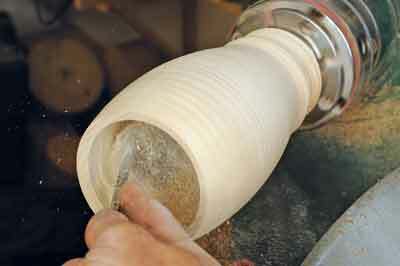 Use a spindle gouge to clean up the opening with the faceplate angled into the work to cut against the grain. Drop the handle a little and present the leading edge so it cuts like a skew chisel, peeling the fibres off. 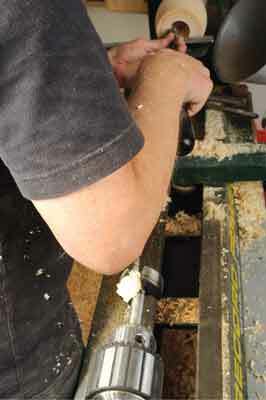 Using a gouge here helps to make light work of removing the waste in the upper section. 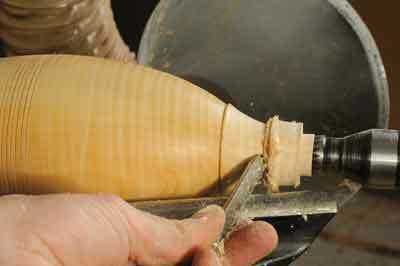 After the spindle gouge, use a scraper to clean up as far as you have reached. A multi-tipped tool is very handy for this as it gives you many options in one tool. The one I'm using is fitted with a bullet-shaped tip, but any scraping tip with a shape that fits the surface being worked on will be suitable. That said, the bullet-shaped top can also be used to hollow out later, in addition to refining it. Now you need to go deeper, so use a smaller drill bit to remove the waste down to about two-thirds of the depth of the inner section. 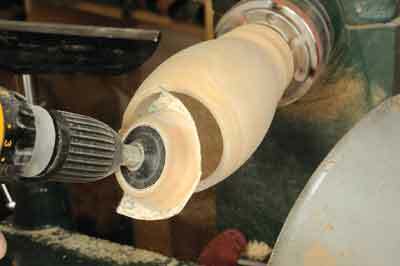 Again, remove the shavings regularly by extracting the cutter. Now refine the side wall and blend the top section with the next section down - the wall needs to be relatively even. 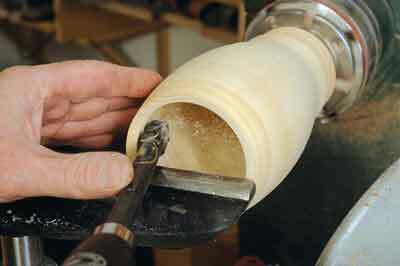 Next, use the tipped tool to extend the inner hollow. Remember to always cut on or above the centreline of the work and never lower the handle so that the tip is higher than the handle. It is better to trail the tip below the handle and rotate the blade to create a gentle cut as this minimises the risk of catching. The deeper you go, the higher the rest needs to be to ensure the correct cutting position. Use an even smaller cutter to cut to just short of the final required depth, then use the tipped tools for further hollowing. The cutting is almost done. The deeper you need to cut into a form, the longer the unsupported reach of the tool will be over the rest, so the shaft needs to be thicker to prevent vibration. This project is, in my opinion, at the limit of the13mm shaft tool I used. 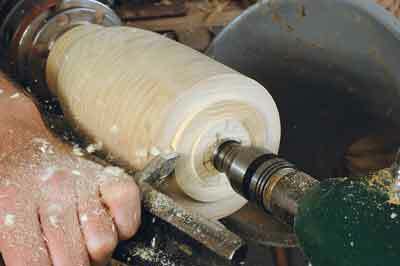 ... such as a sanding arbor, although you may need an extension rod for it. Sand the rim. 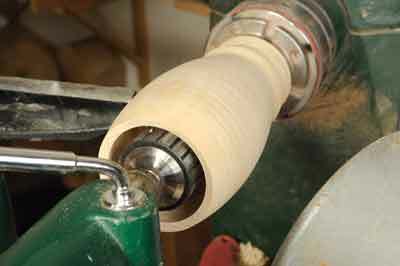 Now refine the outside with a spindle gouge. Take care with this: because the inner hollow closely follows the shape of the outside, any refinements need to be small for the main body, but of course there is waste wood in the lower section so you need to use the chuck. I like to use some form of decorative effect in my work, but only if it complements the visual and tactile elements of the piece. For the base section I wanted to create the effect of the main body of the hollow form floating on a support base. To achieve this, I made a fillet to create a visual separation of the foot section from the body without affecting the visual continuation of the curve too much. This is inspired by designs from the Far East. I also felt the body needed something extra, so I decided to place a few grooves on it. I added an odd number of grooves - I always feel odd numbers look better, perhaps because I can see a centre point. The corner of a parting also works well for adding decoration. You can now sand the item to a fine surface finish. 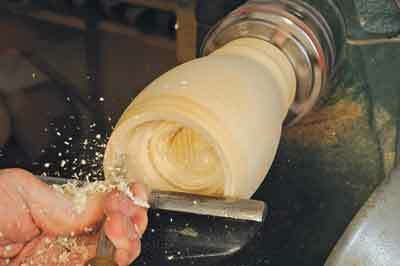 Once the piece is sanded, oil the inside of the hollow and the main body, then wipe off the excess after a few minutes. The forceps come in handy here for holding the cloth when you clean up the inside after oiling. ... then bring up the tailstock for support and refine the bottom section of the foot. A spindle gouge will help you to refine the outside form and a parting tool helps to undercut and remove some of the waste from the base, stopping short of the revolving centre. The last step is to sand the unoiled areas, then apply oil. 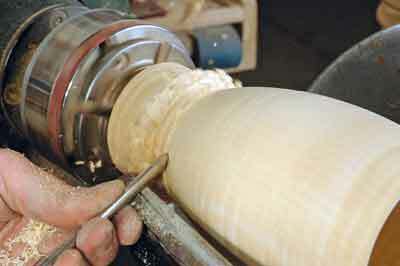 Remove the piece from the lathe, cut off the waste and sand the rest of the base before oiling it.